The Central Bank of Iceland (Icelandic: Seðlabanki Íslands) is the central bank or reserve bank of Iceland. It has served in this capacity since 1961, when it was created by an act of the Alþingi out of the central banking department of Landsbanki Íslands, which had the sole right of note issuance since 1927 and had conducted only limited monetary policy. 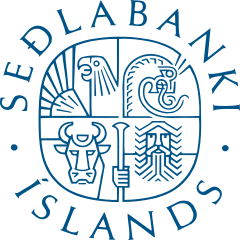 Seðlabanki Íslands is owned by the Icelandic government, and is administered by a governor and a seven-member supervisory board, elected by the country's parliament following each general election. It has the sole right to issue notes and coins of Icelandic krónur and to manage the state's foreign currency reserves. The Central Bank Act of 1986 eliminated the ability of the Central Bank to regulate the interest rates of commercial banks and savings banks. Though nominally independent, the Central Bank of Iceland was historically expected to follow the lead of the central government. In 2001, however, a floating exchange rate policy was introduced and since then the Central Bank has been empowered to adopt an inflation target and manage monetary policy so as to achieve price stability independent of the policies of the central government. ↑ "Leadership and organisation of the Central Bank of Iceland". www.sedlabanki.is. Retrieved 8 May 2012.